As you probably know already, PDF files can’t be edited unless you’re using a special editor. There are some great free ones available which let you do all kinds of things to your files. Besides changing the text and images, you can also add your own content. 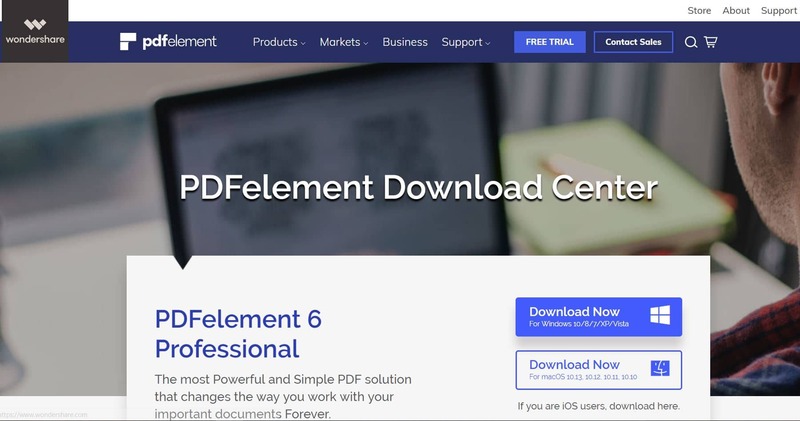 If you’re interested in editing PDF files, you’ve come to the right place because in this article we’ll show you a selection of free PDF editors, the most performant and feature-rich options you can find without paying a dime. What’s great about some PDF editors is that they work right in your web browser. There’s hardly any work to be done besides uploading your file, quickly editing it, and then simply downloading the changed edition back on your PC. The only drawback of online PDF editors is that they usually lack some of the more advanced features found in desktop versions. Those are designed to meet the needs of more demanding users. But, as we’ll soon find out, that’s not always the case. You might also be interested in our article about the Best Free Fax Services. The following editors come with more or less the same features, but almost all share certain restrictions, which is to be expected considering they’re free to use. This article will hopefully be able to clear up some confusion and help you get the most out of these free editors. Some of them have great potential even though paid versions will still come out ahead in most regards. Something to keep in mind while looking at this list of PDF editors is that you don’t have to settle on just one option that seems to capture the most features you need. In fact, it’s highly recommended to edit the same PDF file with multiple editors and use some benefits that are found only in that particular editor. That may seem a little difficult at first, but if you’re looking to do something which can only be done with a certain PDF editor, you can definitely be more productive if you work this way. One of the most powerful options for a free PDF editor is PDF-Xchange. It works perfectly for text editing, adding comments and annotations, as well as converting documents. The fact that it features optical character recognition (OCR) is another great aspect of this software. There are many reasons why this is a solid PDF editor. As opposed to other programs it comes with some great ways to easily keep track of changes made in your documents. At a first impression, it appears very well-packed with features, but if you look closer, you will notice that certain options aren’t available in the free version. That shouldn’t discourage you from using the software. It’s still capable of offering a nice PDF editing experience for free. You can choose to extract certain pages from a very long PDF file or simply delete the unnecessary ones. Adding new content like text and images is a breeze too. Sometimes you need a quick conversion to a Word format. That’s entirely possible with the help of this software without going for a separate converter tool. One particularly handy feature is the OCR which transforms scanned documents into plain text which you can then use like any normal document. This can save you a lot of time when you need to copy some information. When it comes to the user interface, this editor does a very good job. It provides certain extras such as plugins for Firefox and Internet Explorer that you can choose to install. Many people could find them useful as they bring the program’s features into your web browser for more convenient access. It’s important to keep in mind that this tool will add a watermark in case you use certain editing features reserved for premium users. You don’t have to worry though, the program will always give you a warning beforehand. Quite a large number of editing tools aren’t available unless you switch to the paid version, but that’s to be expected. There are still many features integrated into this free PDF editor and it can be said that the developer is generous enough. Not all users will need all those fancy premium features, so PDF-Xchange offers quite a reasonable experience. Taking into account how easily it lets you add your own content to PDFs, and all the other extras, this is not a program to miss if you frequently need to do editing work with PDF files. 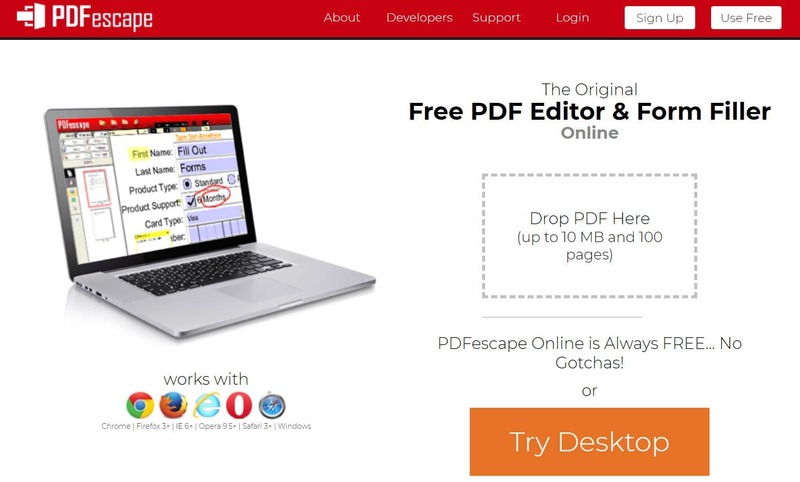 PDFescape combines many solid features that may seem appealing for anyone looking to edit PDFs without paying. It’s a bit confusing at first until you figure out which version should you choose. There are two main versions, one online and another offline – the desktop variant. The most recommended version to use would be the online one as it provides all the features for free, but with a condition. Your files need to stay under 10MB in size and they also can’t have more than 100 pages. Another important distinction that has to be made is that the online editor can only add text or images, it doesn’t actually allow you to change the existing text. The other option is to go for the offline editor which comes in three modes, of which only the most basic is free, the rest are paid. This version will offer a different experience with another interface that seems a little more usable, but it’s not as feature-rich as the online one. With these considerations in mind, lets’ see what PDFescape can truly do for your needs. We’ll take a closer look at the online tool because that seems to be more suitable to cover most people’s editing needs. 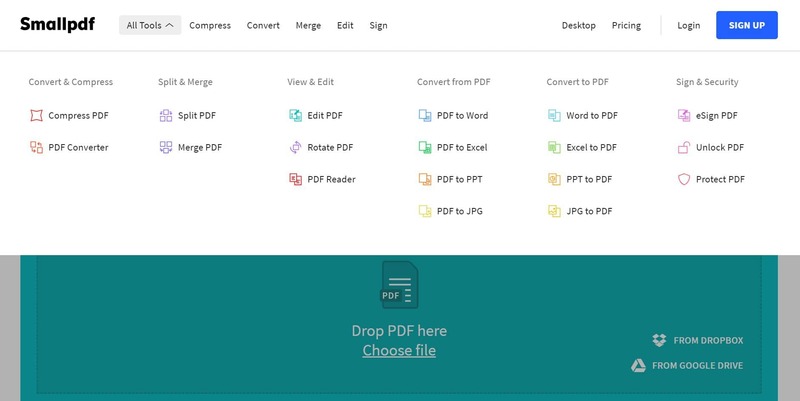 There’s the option to create a brand new PDF file, upload your own, or directly link to an online PDF so it seems you have multiple ways to start editing. One thing you’re surely going to like about this editor is the text tool which offers multiple customization options. It’s similar to how you’d work in Microsoft Office as it allows you to choose a font type, color, size, and other details like that. Adding sticky notes is possible as well as drawing and inserting various lines, arrows, circles, and more. Deleting one or more pages in your document that you no longer need is entirely possible. The online tool can be helpful when you want to organize your documents as it lets you bring pages from other files into your PDF, change the order, or take out certain parts of a page. There are lots of nice features you can use which is surprising for a PDF editor that’s free to use. The final thing worth mentioning about the online version of this editor is how it doesn’t force you to make a user account. It’s only required in case you wish to keep your progress online and download the final result later. All in all, the final verdict for PDFescape online version is a highly positive one. Although the interface feels a little basic, it can be a well-suited option for novice users. As long as you can work with the file size and page number limitations, this free PDF editor is definitely a decent all-around tool. If a quick online PDF editor is what you’re looking for, there’s one offered by Sejda which brings together a powerful set of instruments to go through any editing job. The best part is that it’s completely free and compared to other editors it truly lets you change the pre-existing text in your files without any annoying watermarks. That sounds too good to be true right? Well, there are obviously some limitations as with all free tools of this type. This online editor comes with a time limit, so unfortunately, you need to work pretty fast because after 5 hours files are automatically deleted. You can also go through a maximum of 3 tasks in one hour and documents can’t be over 200 pages long. That looks worse than it actually is. Considering the editing options, this tool is very reasonable allowing you to do a lot at absolutely no cost. You can always pay to get rid of these restrictions, but those in need of editing for personal use will probably find ways to work around them. Now it’s time to take a closer look at the features of this PDF editor. The tool runs in your browser so you can start working right away. Modifying existing text as well as adding custom one is simple and convenient. You can insert images and links or geometrical shapes such as rectangles and ellipses. One option that could be useful for some is the ‘whiteout’ feature. It would have been nice to completely remove the data, but even if it only adds a white rectangle, it’s a good alternative. The handy OCR feature is not included here to deal with scanned PDFs, but you can do other things like sign documents or add annotations. When your editing tasks are done, all that’s left to do is to ensure your changes are saved and then download the edited file. There are other choices to select such as transferring the PDF to Google Drive/Dropbox or create a link you can share with others to download the document. The link works for a week only. While the online tool of the Sejda editor is quite neatly done, there’s also the possibility to download a desktop version. There are certain differences between the two of them. For example, the portable edition gives you a greater selection of font types. The handy ability to link online PDFs is gone though. Overall, Sejda managed to create a reliable free PDF editor with two solid versions. The online one is definitely more convenient, though both of them are easy to use and efficient. Just make sure you don’t forget to check how much time you’ve got left so your work isn’t lost. A highly capable free PDF editor is created by ApowerPDF. It boasts a solid amount of tools to edit your documents and packs other handy features such as PDF conversion and creating your own PDFs. Two versions of this tool exist and you will have to be careful to select the correct one. While the online editor comes with reliable free abilities, the desktop version is only a trial for the paid version. When you go to the website for this PDF editor you’ll discover the two available choices – online and desktop. After you press on the ‘Launch Online’ button you will be required to run a little app that will start the editor. It doesn’t take long before you’re ready to deal with almost any editing tasks. The tool can work on formatting jobs, add new text and images, and for extra safety, it has a password encryption feature. A basic converter will be able to turn PDF files into images. The option to make your own PDF files using just the editor is a huge advantage for a free tool. Usually, you’d expect this feature to be available only in paid PDF editors. A minor issue which needs to be mentioned is that the online version lacks a tool for deleting watermarks from PDFs. Not a huge problem considering the rest of the abilities of this editor. It’s safe to conclude that ApowerPDF deserves more recognition if you’re trying to find a solid free editing tool without too many limitations. As its name implies, PDFsam Basic doesn’t offer the most comprehensive set of tools found in a PDF editor, but it makes up for it considering the user-friendly interface. This is a simple utility focusing on merging PDF files and splitting them in multiple ways. The software comes with support for many operating systems. It doesn’t limit itself to just Windows and Mac, but it accepts Linux computers too. The free version of the program is quite basic feature-wise and the developer added ads in it to suggest upgrading to the paid version. Like it’s been mentioned in the beginning, this tool was designed for mostly two basic operations: merging and splitting. You can easily take entire PDFs and combine them together to form a single file. There’s also the possibility to extract only some smaller parts and merge them. An interesting feature of this editor is the Alternate Mix option when merging documents to alternate the pages. When it comes to splitting, the program provides three methods. You can split a PDF file into pieces with a user-selected size, that’s one way. Another is to rely on page numbers as markers and finally, the last method you can try is to make use of the integrated bookmarks inside the PDF document. Either way, any splitting task can be swiftly handled by this editor. In case you’ve made a PDF from a scanned document, there are useful features that can help you. For example, you can rotate the documents and extract certain pages. There’s no need to deal with multiple splits if your only goal is to save just the central part of your document as a separate file. Those working with lots of PDF files will be pleased to know that this editor has some batch processing functions. Another disadvantage of this free tool, besides the included advertisements, is the way the installer for the software comes packed with other programs that aren’t necessary. This is definitely not unheard of, and it’s not really a problem because opting out works fine. Although there are some flaws and the program doesn’t boast too many powerful editing abilities, the PDFsam Basic PDF editor is worthy of your consideration. Tweaking the content of your files is not really possible with this editor so this why it’s a really basic one. It’s free to try it out, so go ahead and see if it might be what you’re looking for. One decent option for a free PDF editor that you shouldn’t miss comes from FormSwift. Their website-based tool works in a simple manner without the hassle of making a user account. It covers the basics of PDF editing and it’s completely free so that sounds very good so far. There are multiple advantages to using this editor, but before we get into them let’s see first what are its limitations. It’s a free tool after all so that’s completely within expectations. The good news is that there aren’t any glaring restrictions apart from the ability to edit existing text which is usually a premium feature anyway. You can still erase it though if that’s what you were trying to do and that’s possible for images too. Now it’s time to check out what this PDF editor can bring to the table. One important aspect is that it doesn’t bother with adding watermarks so that’s nice. It lets you add a lot of extra content such as custom text and images, and there’s extensive highlight support. This tool makes it a breeze if you plan on signing the PDF file as it offers a bunch of useful options to try. You can either draw the signature, type it, or simply upload it from somewhere else. A great thing we’ve noticed with this editor is that it allows for things like circles and checkmarks to be placed virtually anywhere. Something that could be considered a small issue for some people would be the lack of Google Drive or Dropbox uploading options. You can only add PDF files stored on your PC. That’s a mild inconvenience though, nothing to be worried about. The edited result can be downloaded not only as a PDF file, it can be saved as a DOCX document too. Another handy option is to send it straight to your printer. Some people reported issues with this conversion, but for most PDF files, the process works as expected. The last aspect regarding this editor that’s worth pointing out is the Snap feature. It’s basically a web app that enables users to do a quick editing job from their smartphones as they capture an image of the document. When you’re finished, the resulting PDF can be downloaded or shared. It’s a bit complicated to use this if you’re in a hurry, but it works well if you put in some extra effort. All things considered, the FormSwift PDF editor deserves some credit when you factor in all its solid features that you don’t need to pay anything for. It embodies all of the most helpful tools that any basic PDF editor should contain, so it’s highly recommended if you wish for a free and convenient way to edit PDF files. The Smallpdf Online PDF editor represents a potent combination of user-friendliness and simple, but efficient editing features. It works with almost any operating system and doesn’t have any premium features that need to be purchased. The only downside is that you can’t edit the existing text in the file. The online tool is designed to simplify the process of adding various data such as text, shapes, and pictures. It’s fast to use allowing to implement your signature too. There’s no need to create a user account and you shouldn’t be troubled by any watermarks. If there are areas in the document that you wish to delete, the tool can deal with this by putting white space over them. PDFs can be loaded from multiple sources, and that’s a great thing. The same can be said when it comes to saving them. Use your Google Drive or Dropbox accounts for some extra convenience when storing the edited file. Shapes can be easily imported with this tool and the small selection of three should be enough for projects without high demands. Import either a circle, arrow or square. All these objects can be further customized in terms of main and line colors. You also have the option to increase the edge’s thickness. Another capable feature is the splitter tool which breaks a PDF into page-sized chunks. The text you add can be modified in some ways. Besides changing the color, there’s also the option to go with a different size or font type. Don’t expect customization levels anywhere near Microsoft Office, but still, the choices are decent for a basic free tool. Considering what it can do for absolutely no cost, the Smallpdf Online PDF editor is not bad at all. Even though it’s so simply-designed, the tool presents an impressive set of features that anyone working with PDF files will find useful. Basic editing of PDF files can’t get any easier than this. A tool which manages to get together a very comprehensive set of features is PDFelement Pro. It may sound like you need to pay for it, but you can rest assured. There are no costs involved to take advantage of the advanced functions of this PDF editing software. What’s the catch then? There’s only one big limitation which obviously would be a dealbreaker for many – the editor puts its watermark on every page in your document. If that’s not really a huge problem for you, then you will be greeted by an exceptional selection of professional-grade tools to start performing more complex edits to your PDFs. The editor is compatible with may operating systems including Windows, macOS, as well as smartphones running iOS or Android. There are many aspects regarding this tool that make it a true PDF editor and you can benefit from all of its features for free. Existing text within your files can be altered directly and you can add various items such as images and links. In case you want to merge several documents into one, that’s possible too. One relevant feature that’s included is the ability to edit the background of the pages and they can be cropped without too much effort. Something that’s rarely seen in free PDF editors is the OCR function to convert scanned PDF documents into normal text. If you’d like to do so, you can include headers and footers, so that’s another handy feature. There are lots of actions that can be performed to the PDF pages. It’s not only possible to insert extra pages, remove unneeded ones, but you can also easily rotate or extract them. For boosting the level of security of your documents, the tool offers solid password protection. If you can live with the watermarks, the PDFelement Pro is an amazing free tool to take into account. After all your hard work is done, the editor doesn’t allow saving without the watermarks so make sure you’re aware of this before you start any editing.